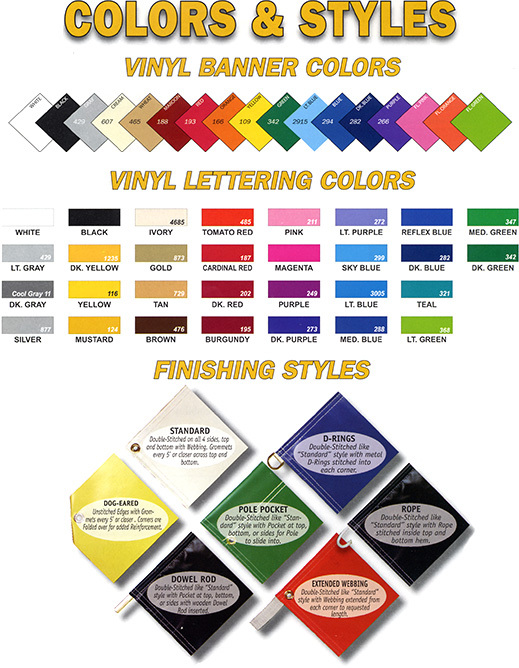 We offer high quality vinyl banners which are extremely durable in any weather condition and are finished with simple spot color and grommets for easy to hang instructions. 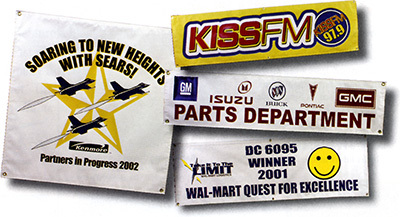 Our custom banners are an affordable solution to communicate a message to your audience in a big way! Contact us today for an estimate! Take a look at our bold and vivid full color digital banners to showcase your promotion and leave a big impression all at an affordable price. These beautiful and highly effective banners are great for complimenting a trade show, annual event, or for advertising in high traffic outdoor areas. Whether you want to disguise a construction site, or wrap a side of your building, our digital banners are versatile, durable and a smart choice for professional advertising. Framing systems for your banner are available as well. 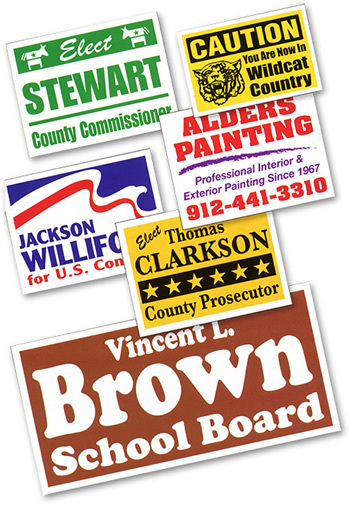 Easily turn your vehicle into a mobile billboard with our clean and professional magnetic signs which are easily detachable as well as attachable to your vehicle. Whether you’re looking for a straight to the point, simple design or a full color eye-catching design, our expert design staff is happy to bring attention to your business while keeping your budget in mind. 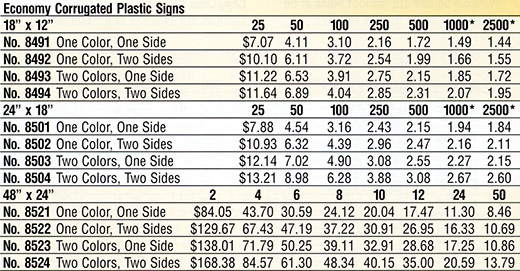 We provide premium corrugated plastic signs perfect for both indoor and outdoor usage. 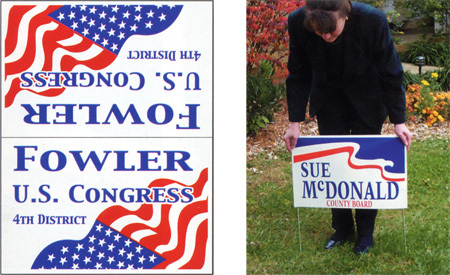 At 4mm thick, this lightweight material is not only an economical choice but an affordable choice for realty, political, contracting signs and much more. 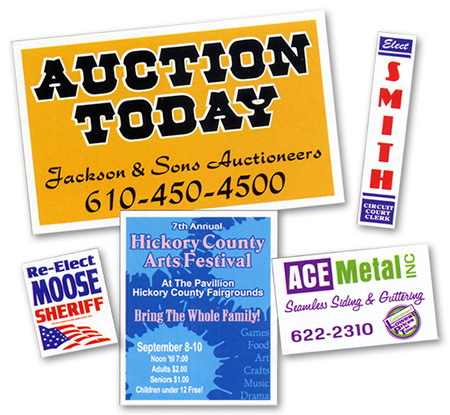 Our prices are based on single sided signs, including one background and lettering color. Our all weather posters we offer are screen printed on 24 pt (6-ply) white weather resistant poster board. Our printing experts will work with you step by step to help choose the best materials needed for your poster presentation. We are happy to provide a number of paper and finishing options to best fit your image and budget requirements. We also encourage you to make us aware of any deadlines so that we may successfully accommodate your next event. Full color is highly capitalizes and captures photo-realism or simple text.